At a Feng Shui workshop last week, I learned water activates wealth. No wonder so many of us have water features in our gardens! The movement energizes those negative ions (those are the good ones!) and the sound can be so soothing. 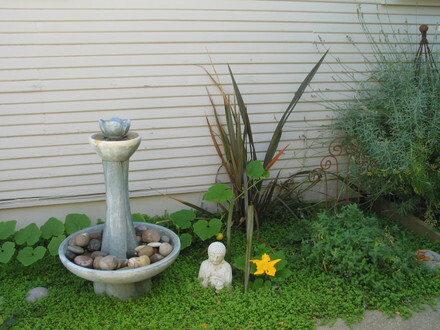 Thought you might like to see some samples on Quince St.
flanked by Buddha, squash and phormium . which Erin is planting with pansies. Max is lending Dante a hand. by racoons hunting goldfish and trampling most everything. 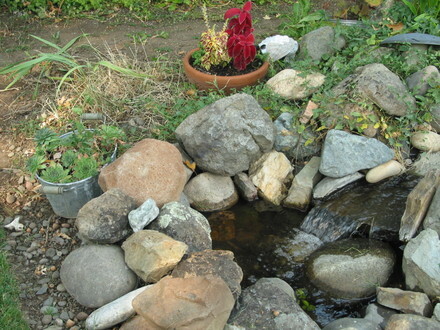 Hilda’s waterfall pond is faring better, with pots of pretty coleus and hens & chicks. Erin finds treasures everywhere. 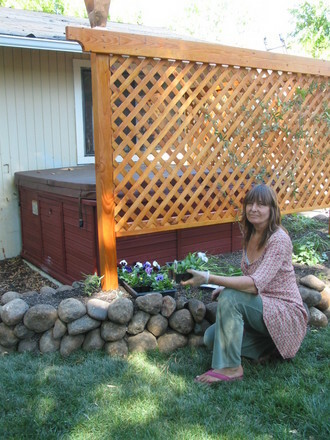 She turned on old trough once used for testing for tire leaks into an unusual water feature, backed by bamboo in a pot. The racoons ate her goldfish and the water lettuce as well, but left the anenomes and fuschias for us to enjoy. 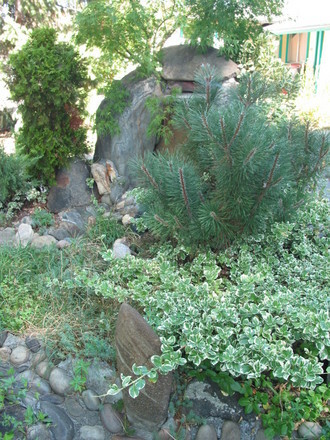 Jose’s rock fountain is well established with a Japanese maple screening the driveway, euonymous, ivy, and other shade lovers tucked around. 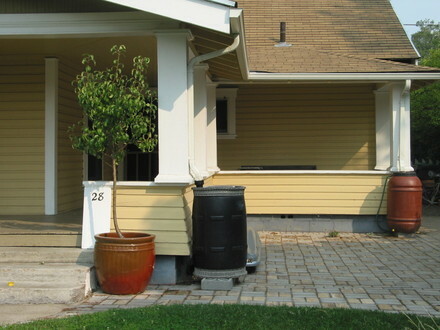 The extension service promotes water conservation. These folks made rain barrels at one of OSU’s Ext Svc workshops. 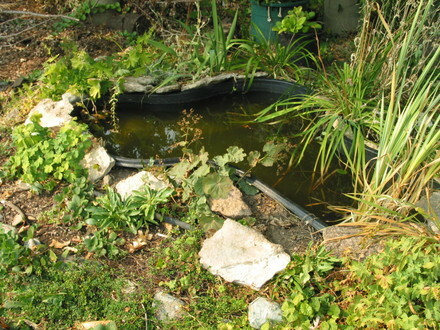 Inspired, I have added my own small reservoir with charming, chiming pings. Okay, so I’m starting small. Now that this water feature is activating the wealth energy, I’m dreaming big! Next post: Musical Houses on Quince St. So that's why I'm poor !! lol. I'l have to get a water feature now. 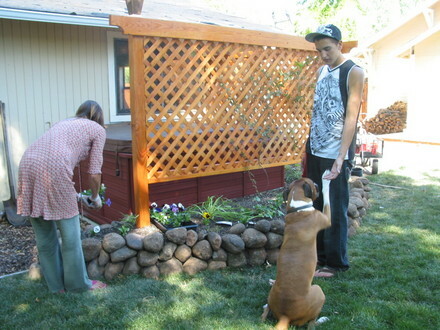 ~love that pic of Max the boxer but those racoons are a real pain! we will all have to get a water feature asap! 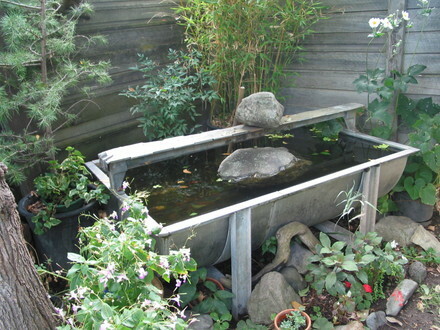 Nice blog OG its a lovely idea to show the neighbouhoods water features like this ,I wanna hot tub like that one!!!!! Hywel the meek shall inherit the earth. Like you, Hywel, I'm wondering why I'm not rich! This area is studded with rising wells, called 'fuente' here, and we have one in our garden which makes a muddier patch when there's been rain, and the lanes around the village have many troughs being continually filled with spring water. The builders of our casa connected us up to a natural spring so any day now I should start to look sixteen again! I once watched a lady who her and her husband had a great large detached house, business, every thing you could think of, and she got bored and disasisfied with what she had, being bored she thought she would get a fung shui lady in, to position her home for her, the lady done what she asked placed things in house and garden and left. Not many months later their business fell, they ended up being divorced, losing all their money as that too was lost in shares, in other business, could nt pay their bills and lost her home too, ended up no money no husband no business and no home, she had to sign on and rent a property, so the moral is be careful with Fung Shui, be satisfied with what you have. I think you're right, Morgana, feng shui and the positioning of water and other things is more powerful than we're aware of! 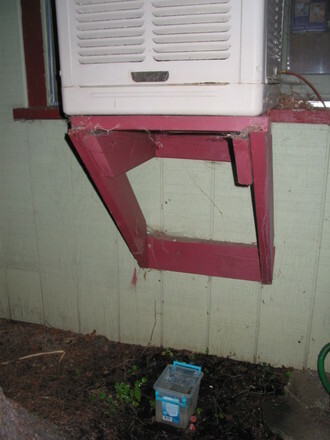 Someone in another blog offered to post something the subject of feng shui & I look forward to more information. When I was in Canterbury, friends told me about the ley lines, or dragon lines, relating them to the song lines of the aborigines. Current interest in telluric emanations and labyrinths bespeaks some awareness of the impact and perhaps a worthwhile area some may wish to delve into further. I say if it an't broke don't fix it. Morgana I have to agree with you there. I feel that if the balance is good already then there's no need to make changes. Thanks, JungleJen, look forward to learning more about balance! Of course, if it's working, you have intuitively arranged things perfectly! My neighbors seem happy with their water features wherever they are placed: it's just the movement and sound of water that's so nice. 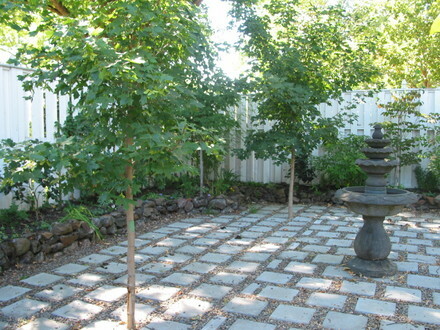 I'd be happy to find a good bird bath for my feathered visitors.